Spotting is the act of supporting another person as they do an exercise, in order to allow them to lift more then they normally could. Spotting is done for safety in case someone can’t lift a weight. A spotter’s job is to make sure the weight does not fall onto the lifter. There are different ways to spot on different exercises. Sometimes the lifter may have a preference as to what they want the spotter to do. Spotting can have a placebo effect on the lifter. 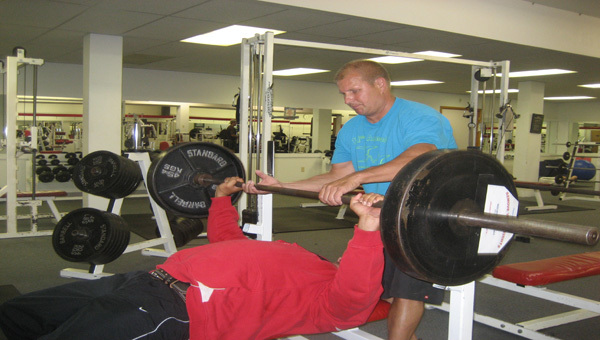 Even if the spotter barely touches the bar or the participant, they may automatically get a boost of energy to lift extra weight because of the feeling of security. A spotter should never alter the movement of the exercise. That may put the lifter off balance which can be disastrous if they are lifting a lot of weight. Sometimes two spotters may be necessary for extremely heavy lifts on the squat or bench.